The argument presented by Westrip (2017) for possibly down-listing the Relict Gull from globally Vulnerable to globally Near Threatened is based largely on the assertion that the species does not meet the requirements for IUCN Criterion D2. This is even though the species breeds at only a limited number of locations that have already been and could be strongly affected by climate change (and mismanagement) in the future. In addition to multiple problems at breeding sites, it also seems appropriate to consider in rather more depth the status of non-breeding habitat, which should in my opinion trigger listing for the species as Vulnerable (or even as Endangered) under one or more of IUCN criteria A1 c); B1 b); B2a) and/ or B2 b). Based on present understanding, perhaps all Relict Gull depend on East Asian intertidal habitats in the winter period (~November-March). This assessment is somewhat contrary to BirdLife International’s (2017) assertion, that “there is also evidence that some winter inland on the northern flank of the Qinghai-Tibet plateau, China”. This assertion, unsupported by any reference in the 2017 BirdLife Factsheet for the species, appears to be based on a single record (made at exceptional altitude for the species) in 1989/1990. Even if misidentification or misreporting were not involved, incomplete documentation of that report nonetheless led Duff et al. (1991) to conclude that “we do not know whether the possibility of passage has been fully ruled out”. Notably, there appear to be few if any subsequent winter records of Relict Gull from this or any other inland area, even though large concentrations have recently been well-documented in the coastal zone (e.g. Townshend 2015). In the absence of evidence to the contrary, the Relict Gull should therefore be assessed as a species that is ecologically dependent on coastal wetlands in winter. Moreover, the Relict Gull is very locally distributed in winter. All reports of large (or even of medium-sized) flocks in recent years have been from the shores of the Yellow Sea, most especially at a very few sites in Tianjin and Hebei Provinces, Bohai Bay, China. The remainder (perhaps <10% of the total population?) is currently suspected to winter along the east coast of the Korean Peninsula (with more research required to identify any potential key sites for the species in the northern provinces) , in the southern part of the Yellow Sea, and along the East China Sea coast. And even within favored coastal wetlands, foraging Relict Gulls are near-confined to tidal-flats with firmer sandy substrates and patches of silt or mud (typically the outer parts of estuaries) which support a high concentration of shellfish, with only a few individuals (mostly First-winters) also found on sandy beaches in bays and close to river-mouths. The species therefore tends to use only a small part of potentially available intertidal habitat. In Annex 1 (“Uncertainty”) of the Red List criteria, the IUCN states that, “In cases where there are evident threats to a taxon through, for example, deterioration of its only known habitat, a threatened listing may be justified, even though there may be little direct information on the biological status of the taxon itself.” There is, of course, now plentiful evidence (1) of substantial loss and degradation of intertidal habitats in the Yellow Sea, leading to the conclusion that the habitat itself meets IUCN’s Endangered criteria (Murray et al. 2015); and (2) that this substantial loss and degradation of Yellow Sea intertidal habitat is a major driver of decline in many ecologically-dependent species, most especially migratory shorebirds (e.g. Studd et al. 2017). It therefore seems reasonable to assume that the extremely rapid rate of loss and degradation of Yellow Sea tidal-flats will result in substantial and rapid declines in this specialised and locally distributed gull species – especially as many of the areas preferred by the species are already undergoing or are targeted by reclamation. Indeed, even the site in Tianjin where a single flock of 10,405 (the majority of the world population) were counted in March 2015 is said to be threatened with imminent reclamation (Townshend 2015). Although there are perhaps too few count data available to trigger Criterion A1 (“an observed, estimated, inferred or suspected population size reduction of ≥ 50% over the last 10 years or three generations, whichever is the longer”), the Relict Gull has already decreased markedly in the Republic of Korea (ROK) in recent decades. Likely to have been overlooked until the 1990s (see Duff et al. 1991), the species appeared at the turn of this century to be regular in winter at 6-8 sites (e.g. Park 2002) – with a maximum of 185 recorded by one team of observers during survey effort along most of the west and south coasts in early 2001 (see Moores 2005). However, there has been rapid and substantial loss and degradation of intertidal habitat in the ROK, as elsewhere within the Yellow Sea and coastal China and Japan (with 60% of the 75% of historical tidal-flat area that has been lost in the ROK being reclaimed in only the past three decades: Birds Korea 2010; Moores 2012; Mackinnon et al. 2012). Reclamation has led to a substantial loss of foraging area including at Song Do, Incheon (where 143 were counted in a small area in 2001); and an estuarine dam, reclamation and increased pollution following the Four Rivers project have also affected the Nakdong Estuary, where at least 40 were counted in the 1990s, with <10 there in all recent winters. In the past five winters there have been probably <15 overwintering Relict Gull nationwide – a national-level decline of substantially >50% over three generations. 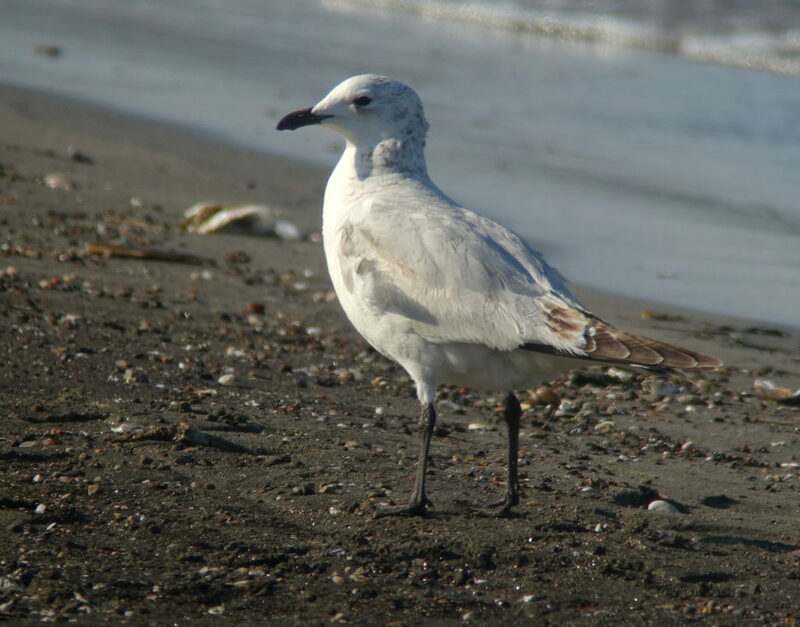 In the wintering range, the Relict Gull remains highly threatened by habitat loss, degradation, pollution, and perhaps competition with shellfisheries. The species is also highly threatened by climate change and habitat change in the breeding areas. There is no compelling evidence of recent increase in the population. Rather, a massive recent increase in observer activity has now identified key sites for the species; and we now know that many of these sites are under threat of loss and continuing degradation. A massive population decline over the next three generations is now anticipated – unless the conservation of the species’ habitat is greatly improved. Birds Korea. 2010. The Birds Korea Blueprint 2010 for the conservation of the avian biodiversity of the South Korean part of the Yellow Sea. Published by Birds Korea, Oct.2010. Duff, D., Bakewell, D. & M. Williams. 1991. 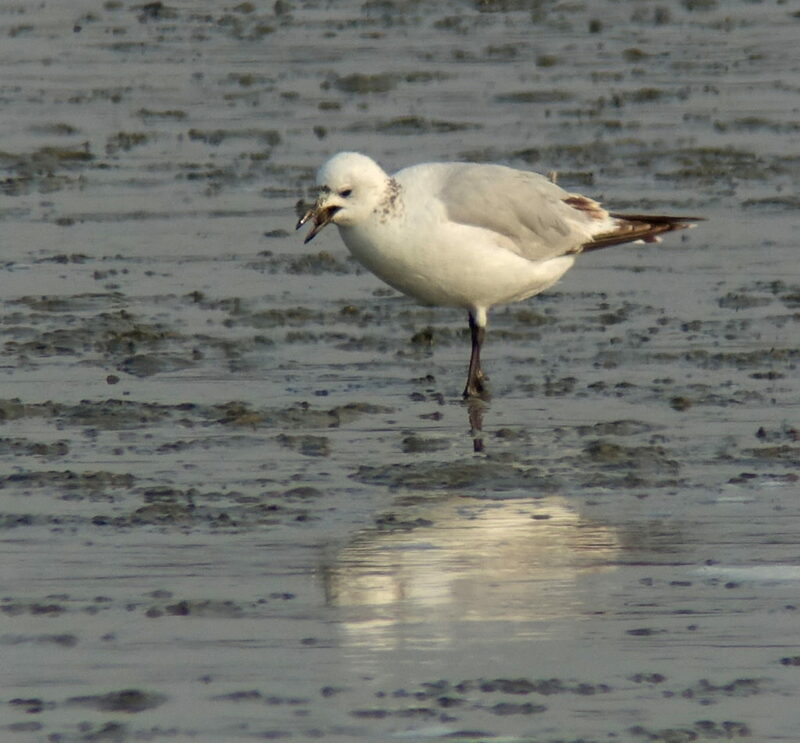 The Relict Gull Larus relictus in China and elsewhere. Forktail 6: 43-65. Gill, F. & D. Donsker (Eds). 2017. IOC World Bird List (v 7.2). doi : 10.14344/IOC.ML.7.2. MacKinnon J., Verkuil Y. & N. Murray. 2012. IUCN situation analysis on East and Southeast Asian intertidal habitats, with particular reference to the Yellow Sea (including the Bohai Sea). Moores, N. 2012. The Distribution, Abundance and Conservation of Avian Biodiversity in Yellow Sea Habitats in the Republic of Korea. University of Newcastle, Australia. Unpublished PhD thesis (in English). Moores, N., Kim, A. & Kim R. 2014. Status of Birds, 2014. Birds Korea report on Bird Population Trends and Conservation Status in the Republic of Korea. Published by Birds Korea, September 2014. Murray, N., Ma Z. & R. Fuller. 2015. Tidal flats of the Yellow Sea: A review of ecosystem status and anthropogenic threats. Austral Ecology 40, 472–481. Park, J-Y. 2002. Current status and distribution of birds in Korea. Department of Biology, Kyung Hee University, Seoul (unpublished thesis, in Korean).